Welcome to United States History Period 5! In this series, we will cover a multitude of topics and themes crucial to the development of the United States. Period 5 discusses events leading up to the Civil War, the conflict itself, and the aftermath of Reconstruction. 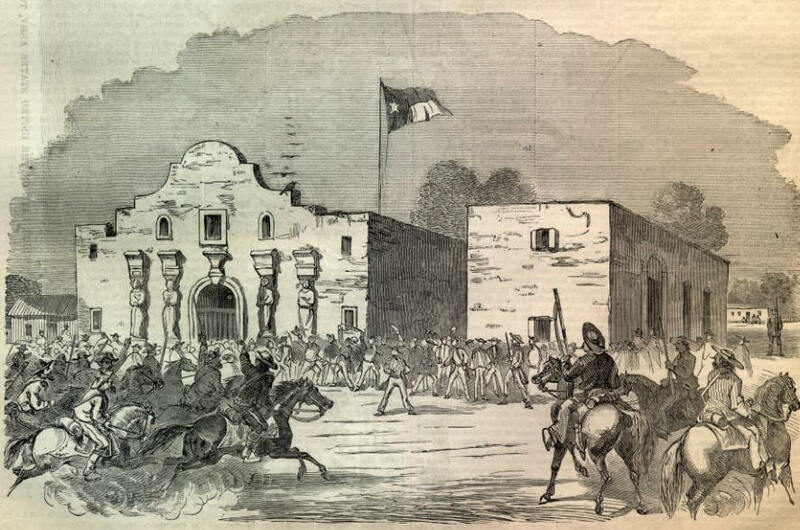 In the mid-1840s, the United States integrated the Republic of Texas into the Union and soon afterward declared war on Mexico, annexing much of the modern Southwest. The addition of this territory to the US extended the debate over slavery to conquered soil. The North and South carefully negotiated a delicate balance between free and slave states through the Compromise of 1850, which soon fell apart through growing national tensions over slavery and nullification. 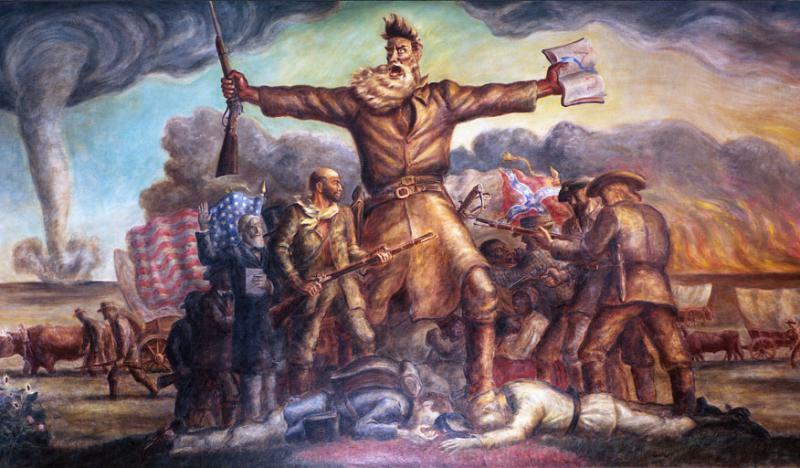 Debates over popular sovereignty to determine slavery status, violence in the territories over Nebraska and Kansas over this issue, and political divisions placed the United States on the brink of fracturing. The 1860 election of Abraham Lincoln as President set in motion the path of seven states to secede from the United States and create the Confederate States of America. At Fort Sumpter in Charleston, South Carolina, Confederate forces fired on the Union garrison, officially starting the American Civil War on April 12, 1861. Get the official Omninox eBook from Amazon by clicking on the book cover above to view more stimulus-based multiple choice questions. “...3. Americans must rule America; and to this end native-born citizens should be selected for all state, federal and municipal offices of government employment, in preference to all others...."
"5. No person should be selected for political station (whether of native or foreign birth), who recognizes any allegiance or obligation of any description to any foreign prince, potentate or power, or who refuses to recognize the federal and state constitutions (each within its sphere) as paramount to all other laws, as rules of political action...."
"8. An enforcement of the principles that no state or territory ought to admit others than citizens to the right of suffrage, or of holding political offices of the United States..."
"9. A change in the laws of naturalization, making a continued residence of twenty-one years, of all not heretofore provided for, an indispensable requisite for citizenship hereafter, and excluding all paupers, and persons convicted of crime, from landing upon our shores; but no interference with the vested rights of foreigners...."
"13. Opposition to the reckless and unwise policy of the present Administration in the general management of our national affairs, and more especially as shown in removing Americans and conservatives in principle, from office, and placing foreigners and ultraists in their places…as shown in reopening sectional agitation, by the repeal of the Missouri Compromise; as shown in granting to unnaturalized foreigners the right of suffrage in Kansas and Nebraska…"
Question: Which legislation was most representative of the goals of the American Party? The Emergency Quota Act of 1924 restricted immigration into the United States, which was a policy adopted by the party as seen in the passage. The American Party was a political entity in the 1850’s that held extremely strong anti-immigrant and anti-Catholic viewpoints. It was often colloquially referred to as the “Know Nothing” Party. This was not a commentary upon their beliefs, but rather a reference to their secretive origins (members were told to say that they “know nothing” about the group). With this in mind, let’s take a look at the specific answers and determine which one is most congruent with the actions and ideology of this group. The Dawes Act of 1887 was a piece of legislation that aimed to restructure Native American communities though the redistribution of tribal land to different Native American individuals. The act forced indigenous people accustomed to tribal social arrangements to take up a western familial structure in which the patriarch provides an income and the matriarch lives at home. Additionally, it gave industries like railroads increased access through indigenous territory which further depleted the natural resources of Native Americans. While the concept of white supremacy was undoubtedly a factor in the ideology of the Know Nothing Party, the group focused more on restricting immigration than on legislation affecting indigenous people. The Emergency Quota Act and Immigration Act of 1924 together enacted limitations on how many individuals could immigrate to the United States based on national origin. The law stated that no more immigrants from a specific country could be admitted once the yearly immigration count from that country represented 2 percent or more of Americans with that ancestry. For example, if 1 million Italian-Americans lived in the US, then no more than 20,000 Italian immigrants could be accepted per year. Speaking of Italian Americans, immigrants from Southern and Eastern Europe -- predominantly Catholic -- were particularly affected by the law. Remember that the Know Nothings disliked immigration and Catholics. The Emergency Quota Act most certainly reflected the goals of the American Party. On the other hand, the Immigration and Nationality Act of 1965 essentially reversed the quota system enacted in the early 20th century and promoted immigration of skilled laborers. This definitely is not what the American Party would have wanted. The last choice is trying to trick you. The Alien Act could be seen as reflective of Know Nothing ideals, as it simplified the process to deport foreigners and increased the difficulty of immigrant naturalization. However, the option given is simply the Sedition Act, which made criticizing the federal government a jailable offense. Authoritarian, but not specifically related to the American Party. A. use of popular sovereignty in settling slavery debates. B. circumstances surrounding the Mexican-American War. C. election of Abraham Lincoln. D. social reform movements of the antebellum era. The passage directly mentions use of popular sovereignty in settling slavery debates. A quick read of the passage should have you thinking about a few key words and concepts. Suffrage, the Missouri Compromise, and references to Kansas and Nebraska are important to understanding this excerpt. Recall that the Missouri Compromise of 1820 established the 36°30′ parallel as the line above which slavery was prohibited. As settlement grew westward, political forces sought to renegotiate the boundaries between free and slave America. In 1854, the Kansas-Nebraska Act was signed into law by President Pierce and effectively made admission of new territories into the Union as free or slave states depended upon their own constitutions, in other words popular sovereignty. Answers B and C don’t make much sense, since Mexico is never once mentioned, and Abraham Lincoln’s election took place in 1860 -- four years after this excerpt. The word antebellum references the pre-war period in the American south, but this passage has little to do with social movements, rather it espouses anti-immigrant sentiment coupled with dissatisfaction in the contemporary debate over slavery. Nativism is the political position of supporting a favored status for certain established inhabitants of a nation (i.e. self-identified citizens) as compared to claims of newcomers or immigrants. Nativism is the ideology that corresponds to a preference towards native born individuals rather than immigrants or foreigners. As we’ve discussed, the American Party was a political group borne out of grievances about immigration to the US, so nativism is an apt description of their platform. Abolitionists and expansionists were the two sides of the debate over slavery, the former pushing for the practice to be banned, and the latter wishing that new states would be admitted to the Union as slave states. Despite the mention of Kansas-Nebraska and slavery in their platform American party was actually somewhat in the middle when it came to the issue of slavery, and did not strongly favor either side. The Whigs were another party entirely that dominated Northern politics from the 1830’s to 1850’s, when disagreements over slavery caused a split. The anti-slavery faction proved to have a greater influence in the end, and forced President Millard Fillmore off of their ticket in 1852. Many Southern Whigs joined the Democrats, while Northerners mostly became a part of the new Republican Party. The Whigs were more or less neutral when it came to immigration issues, so this excerpt does not represent their ideology. B. higher pay for railroad workers. The passage came from the Know-Nothing Party. The popular name for the American Republican Party, later called the American Party, which was established in 1843 with the aim of restricting immigration and preventing Roman Catholics from holding public office. Just like we talked about in question 1a, the American Party was created with the intention to restrict immigration to the US and to prevent Catholics from gaining power in American politics and society. In regards to the other choices, taxation and unionization were not priorities of the Know-Nothings, and could be considered a type of economic populism in contrast to the American Party’s anti-immigrant populism. Test-tip: Vague and unspecific phrases like “internal improvements” are rarely the answer in a multiple-choice setting! A. the assertions of the Free Soil Party. B. the Dred Scott decision. C. migration to the Pacific Northwest. It deals with migration from abroad, as reaffirmed by the tone and context of the Party Platform passage. The passage came from the Know-Nothing Party. the popular name for the American Republican Party, later called the American Party, which was established in 1843 with the aim of restricting immigration and preventing Roman Catholics from holding public office. Once again, the focus of this excerpt (and the American Party for that matter) was on foreign immigration. Migration from abroad is an excellent answer to this question. Migration to the Pacific Northwest has little to do with international immigration and instead was a subset of westward expansion. The Free Soil party was a minor party centered in the North that focused on abolitionism, which eventually was absorbed into the Republican party in the late 1850’s. Although this passage discusses the expansion of slavery, it does so with the intention of revoking immigrants and Catholics from positions of power in newly founded states. It makes more sense that this excerpt is a reaction to migration from abroad rather than slavery issues explicitly. This is one reason answer B is also incorrect, since the Dred Scott decision related to slavery and not immigration. It also occurred in 1857, a year after this excerpt was published. Although its not necessary for this question, you should know what the Dred Scott decision entailed as it was one of the most consequential Supreme Court cases in American history. Dred Scott was a slave who was taken to the North by his owner. 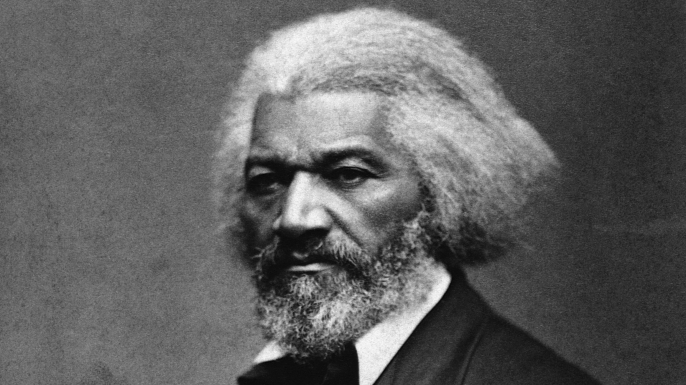 He sued in federal court for his right to freedom, since he was no longer in a state that legalized slavery. However, the Supreme Court ruled in favor of his owner, and argued that Scott had no right to sue because African-Americans could not be considered US citizens. This legally invalidated much of the anti-slavery caused, and resulted in immense criticism from many Northerners, and was a key event preceding the Civil War. “Texas is now ours. Already, before these words are written, her Convention has undoubtedly ratified the acceptance, by her Congress, of our proffered invitation into the Union... Her star and her stripe may already be said to have taken their place in the glorious blazon of our common nationality; and the sweep of our eagle's wing already includes within its circuit the wide extent of her fair and fertile land. . . ."
"Why, were other reasoning wanting, in favor of now elevating this question of the reception of Texas into the Union, out of the lower region of our past party dissensions, up to its proper level of a high and broad nationality, it surely is to be found... in the manner in which other nations have undertaken to intrude themselves into it...in a spirit of hostile interference against us, for the avowed object of thwarting our policy and hampering our power, limiting our greatness and checking the fulfillment of our manifest destiny to overspread the continent allotted by Providence for the free development of our yearly multiplying millions. This we have seen done by England, our old rival and enemy; and by France, strangely coupled with her against us." A. an attitude of American cultural superiority drove westward expansion in the early 19th century. B. American diplomats in the 1840s actively pursued diplomatic relations with England while eschewing relations with France. C. the Market Revolution led to increased economic links between the North and the Midwest. D. fears of the spread of radical political ideologies led to the restriction of immigration in the 1840s and 1850s. An attitude of American cultural superiority drove westward expansion in the early 19th century- this is seen through the tone of the text excerpt. This excerpt by John O’Sullivan celebrates the annexation of the Republic of Texas into the United States. In 1846, Texas officially joined the US after winning a war of independence from Mexico. Territorial claims from the newly minted state would provide the basis for the Mexican-American War several months later, in which much of the modern-day American west was annexed by the US. The tone of the passage is clearly one of jubilation and pretension, with such language as: “her star...in the glorious blazon of our common nationality...the sweep of our eagle's wing...the wide extent of her fair and fertile land.” In direct reference to American expansion Westward, O’Sullivan complains of the forces “limiting [American] greatness and checking the fulfillment of our manifest destiny...for the free development of our yearly multiplying millions.” This expressed attitude of superiority makes A an excellent answer for this question. In regards to answer B, despite a moment of tension with France during the Jackson administration, the United States enjoyed warmer relations with the French than the British during the 1840’s. The statement made in option C is true, but clearly irrelevant to an excerpt about Texas, and not the North nor Midwest that already had ample integration into American administration. Likewise, immigration is not an issue directly related to the text at hand, so answer D can be eliminated. A. the formation of a coalition of politicians who opposed the policies of the President. B. the use of popular sovereignty to determine Texas’ slave status. C. a debate over whether states retained the right of nullification of federal laws. D. concerns regarding the balance of free and slave states in Congress. This lead to concerns regarding the balance of free and slave states in Congress due to the talks about the annexation of Texas. When Texas was annexed by the United States, there was significant discussion about how to designate it as a slave-state without upsetting the balance of free and slave states in the country. In the end, the Compromise of 1850 was reached in order to progress the national standoff. It allowed Texas to join the Union as a slave state and California as a free state, while shifting some territorial boundaries and leaving the status of future states in the Western region to be determined by popular sovereignty. The timing of this excerpt is key to finding the right answer. The statements expressed in answers B, C, and D all happened and were directly related to the new territories seized from Mexico. However, this passage was written in 1845 after the Republic of Texas became independent and before the US declared war on Mexico. The immediate concern was not the particular mechanism with which to set the slavery status of Texas, but rather the national balance between free and slave states that was already precarious. As such, D is the correct answer. Question: Which of the following events led to a conflict similar to the one referenced in the excerpt above? The Mexican–American War, also known as the Mexican War, the U.S.–Mexican War or the Invasion of Mexico, was an armed conflict between the United States of America and the United Mexican States from 1846 to 1848. It followed in the wake of the 1845 US annexation of Texas, which Mexico considered part of its territory, despite the 1836 Texas Revolution. As discussed earlier, the Mexican-American War directly followed the annexation of Texas. Imperialism and manifest destiny constituted some basis for the conquest, which are echoed in the text by O’Sullivan. Although the Confederates had a stronger military culture and leadership and the defensive advantage, the Union had several benefits which allowed them to eventually overpower the South. For starters, the North had a powerful industrial economy and greater manpower reserves that allowed them to put more soldiers into battle and guarantee robust supply lines. The South attempted gained the support of England and France through economic ties from the cotton and tobacco trades, but this ultimately proved futile. Despite early success in forays into the North including the Second Battle of Bull Run, the Confederate ground troops were checked and pushed back into the South after a draw at Antietam, however the Union did not capitalize on its meager successes. Soon after, Confederate forces regrouped and re-invaded in the North. The Battle of Gettysburg marked the furthest North that Confederate troops would reach, but the Union prevailed in the engagement. In the Western theater, the Union proved more effective than in the East. The Anaconda Plan to overwhelm the South with a blockade from Virginia to the Mississippi River proved extremely effective in crippling the Confederate economy by preventing exports of their principal good: cotton. Eventually, Union forces reached the deep south and engaged in pillaging before forcing a surrender at Appomattox Courthouse on April 9, 1865. Several days later, President Lincoln was shot and killed in Ford Theater by John Wilkes Booth. 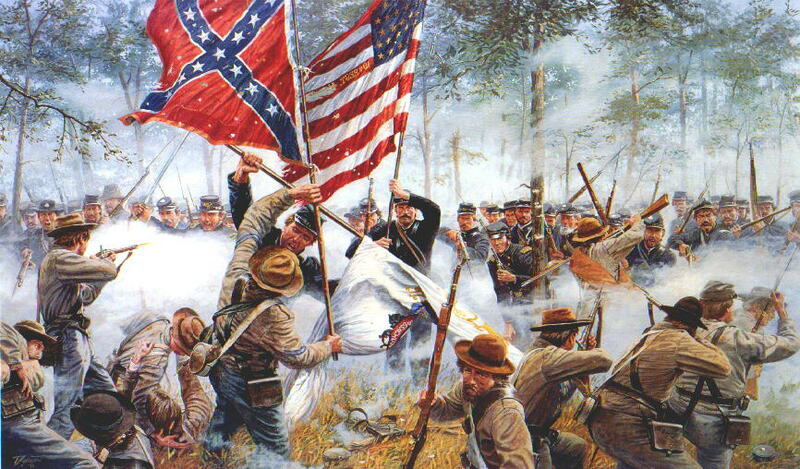 The end of the war allowed Republicans to dominate the political sphere of the United States as the Confederacy was provided the opportunity to rejoin the Union during Reconstruction. The 13th, 14th, and 15th Amendments were ratified which officially eliminated slavery in the United States and provided equal protection under the law for people of all races. The first African-Americans to hold national office were sworn in during this time. Certain benefits were provided to free slaves, and much people movement occurred between the North and South. However, this progress came to an end as Democrats faced a resurgence, and economic and racial conflict began to override northern enthusiasm. After the disputed election of Rutherford B. Hayes in 1876, Republicans accepted the Democratic offer to remove federal oversight of the South in return for a smooth confirmation as Hayes as the next President. In 1877, Reconstruction ended, and would leave unresolved significant racial tensions that would not be addressed until the Civil Rights Movement a century later. Kyle Dixon is a Marketing Intern at Omninox. He is currently an undergrad at Stanford University. In his spare time, he enjoys skiing, writing, drinking coffee, and exploring cities.